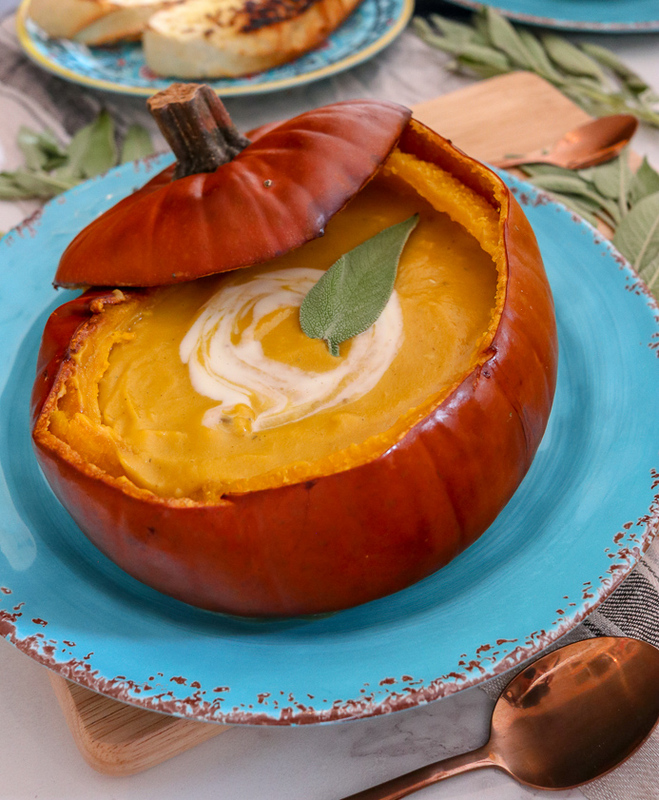 Pumpkin soup recipe – served in a tureen carved from its very own shell. 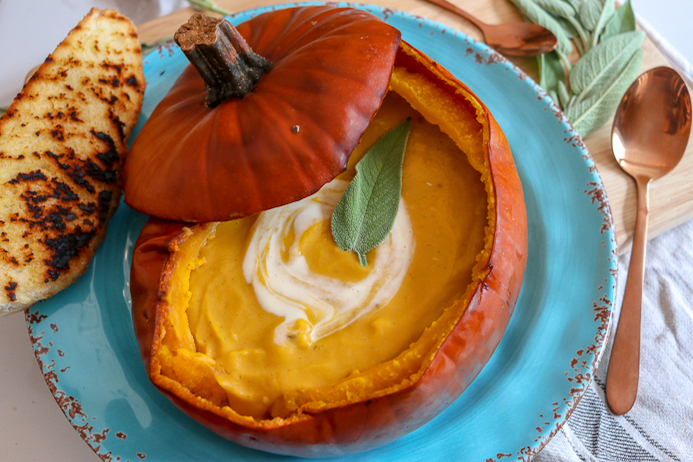 My favourite way to enjoy this gorgeous gourd, above all else, is to make creamy pumpkin soup. However, this is no ordinary pumpkin soup. Oh no! This soup is extra souper because it is served in a tureen carved from its very own shell. How you like them apples? 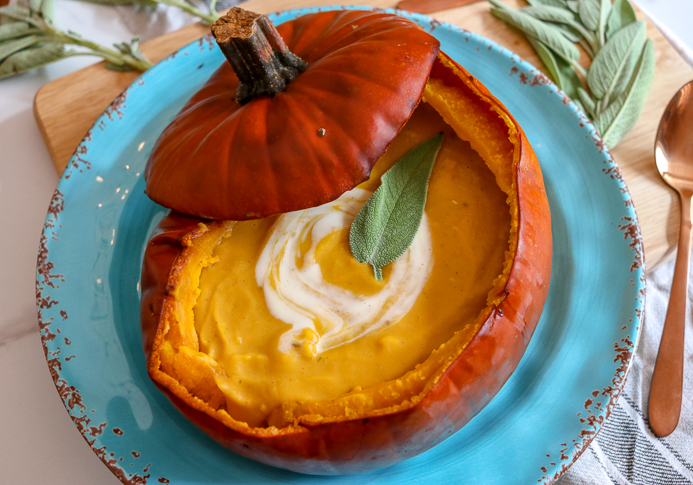 This soup is such a showstopper that it would, therefore, make a perfect centrepiece for a Thanksgiving dinner, Halloween party or as an extra special supper on a blustery autumn evening. Furthermore, like most of my recipes, it is super simple to make. It only has five ingredients plus whatever herbs and spices you happen to have in your store cupboard. Also, like many of the recipes, you’ll find on my blog, this one is adaptable to a variety of dietary needs. For example, this soup is vegetarian, but to make this pumpkin soup recipe vegan, just leave out the butter and use oil. You can omit the cream altogether too, or use coconut cream or coconut milk instead. The pumpkin soup recipe is naturally gluten-free as long as you use gluten-free stock and serve it with gluten-free bread. Furthermore, you can also omit the salt if you are on a low sodium diet but make sure you bump up the flavour by going extra hard on the herbs and spices. When it comes to the cream, I always use Avonmore cooking cream in hot and savoury dishes as it doesn’t split or curdle. I’ve used it for years, in fact, my very first blog post was an Avonmore cooking cream recipe for Creamy Chicken and Mango Curry served with Cucumber and Mint Raita. Avonmore Cooking Cream also has 50 per cent less fat than standard cream, which is an added bonus. 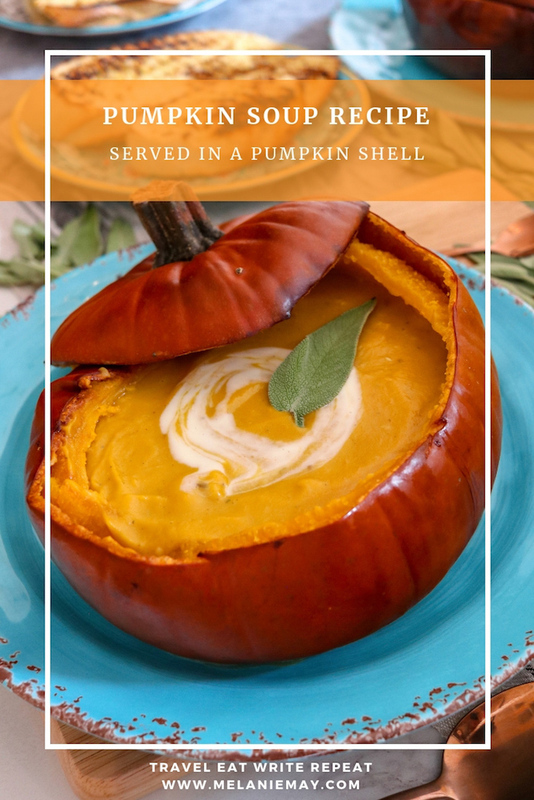 If serving the soup in the pumpkin shell, you will need one small pumpkin per person. I used two medium-sized pumpkins for this recipe and it made about 2.5 litres of soup – that’s a lot of soup! I used 1 tablespoon of ground mixed spice (cinnamon, coriander, nutmeg, clove, pimento and ginger) and 1 tablespoon of a falafel/hummus mix (sesame seeds, cumin, sea salt, coriander and chilli). However, you can use whatever spices you like. Pre-heat oven to 180°C / 160°C fan assisted / 350°F / gas mark 4. Firstly, cut the top off the pumpkin and set aside. Scoop out the guts (the seeds and fibres) from the middle. You can discard these or keep them and use them in something else. Here are 28 things you can do with pumpkin guts. Place the pumpkins on a non-stick baking sheet and brush the insides with the melted butter and season with salt and pepper. Put the tops back on the pumpkins and place in the preheated oven (if the pumpkins are too tall just take the tops off and place on the tray). Place a large saucepan over a high heat and add the oil and butter. Add the chopped onions and fry for about 10 minutes stirring frequently so they don’t burn. Reduce the heat to its lowest setting, put a lid on the saucepan and leave the onions to cook slowly for at least 30 minutes or better yet, until the pumpkins are done. Next, cut about 1/4 off of the bulb of garlic at the pointed end (not the flat, root end). You can discard this bit that you cut off. Place the garlic on a piece of foil and drizzle some olive oil over the cut surface, and sprinkle with salt. Close the foil to make a parcel of garlic. When the 30-minute timer goes off, add this garlic parcel to the tray in the oven with the pumpkins. Set another timer for 30 minutes. When the 30-minute timer goes off, check the pumpkins by taking off the tops and checking the flesh inside, which should be soft. If they need more cooking time, put them back in the oven and check them every 5 minutes or so. When the pumpkins are cooked, take out of the oven and place the tops to the side for safe keeping. Take a spoon and gently scoop the flesh out of the pumpkin shells being careful not to pierce the skin. Leave about 1cm of flesh around the edge to help the shell hold its shape and to prevent leaks. Place the flesh in the saucepan with the onions. To keep the pumpkin shells warm, back in the oven (make sure the oven is off so they don’t burn). Unwrap the garlic from the foil and squeeze the garlic bulb into the saucepan. Add half the stock to the saucepan and mix well. Bring the soup to the boil. Transfer the soup to a food processor in batches and blend until smooth or use an immersion blender. As you blend, add more stock and/or cream until you get the consistency that you like. Return the soup to the saucepan and add bring to a low simmer. When you are ready to serve, place the warm pumpkins on their serving dishes (it is easier to do this before you fill them with the soup). Using a ladle, carefully fill the pumpkins about 3/4 of the way full with the soup. Drizzle some cream on the top and/or olive oil. Garnish with herbs of your choice. Top with croutons or cheese, or all of these! Place the lip back on top of the pumpkins and serve with some fresh bread. So, what do you think of my Pumpkin Soup Recipe? Did you try it out? Did you like it? What improvements would you make? Share a photo of your own attempt at this scones recipe or leave any feedback and comments below, I’d love to hear from you. If you liked this roast pumpkin soup recipe you might also like my quinoa salad with halloumi recipe. Or you might enjoy making my fluffy American pancakes recipe. You might also like my recipe for chicken curry with mango and raita. 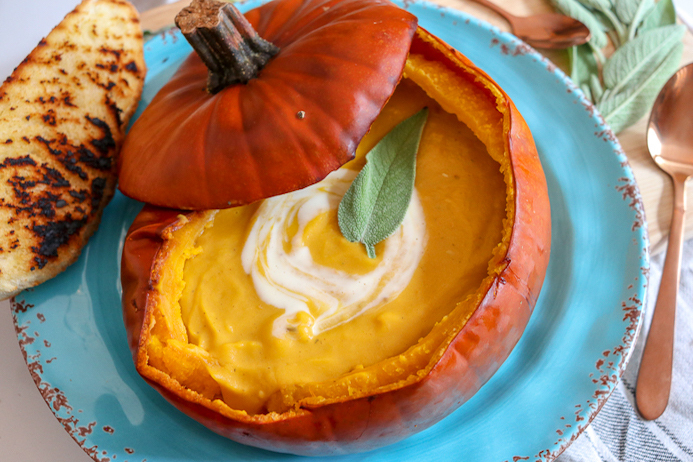 If you like this creamy pumpkin soup recipe, please share with others. 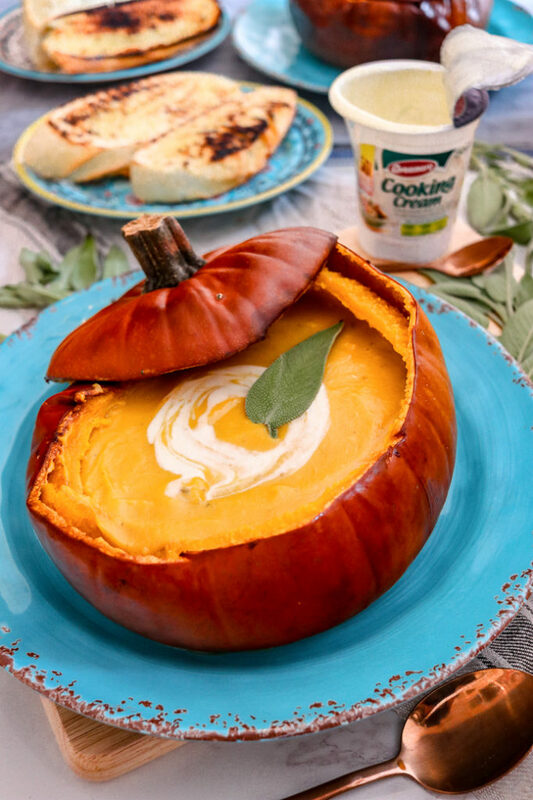 Thanks for sharing a such a good and tasty pumpkin soup recipe, keep sharing such a new and interesting recipes. Thank you so much. It tastes even better than it looks.